LNBF works to minimize the impact that clothing has on the environment. It was started in 2007 by a team who wants to create a sustainable world for generations to come. 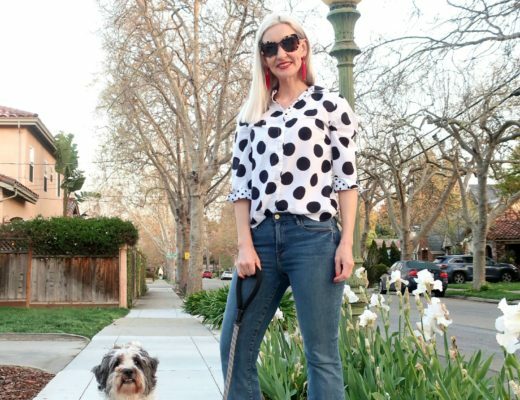 The brand uses bamboo viscose, organic cotton, Tencel, and Modal materials, certified by the OCIA (The Organic Crop Improvement Association). You can find out all about Leave Nothing But Footprints here. I’m modeling the Selena Layered Tunic and Suri Full Length Leggings. Both pieces are so incredibly soft and comfortable! I love the way the tunic/leggings combo gives an impression of a mini dress/skirt without the actual exposure. Here I’m wearing the Niki Long Sleeve Top in eggplant. This bamboo viscose is a miracle fabric. It is moisture-wicking and thermo-regulating. Can I just tell you how comfortable that is for a women in the midst of some hellish hot flashes?! LNBF has generously offered my readers a discount code for 20% off for now through Feb 12th! On top of that, here’s your chance to win an $85 gift card for Leave Nothing But Footprints! Winner will be announced at next week’s link up. Catherine of Not Dressed as Lamb is slaying it in this fab orange coat. 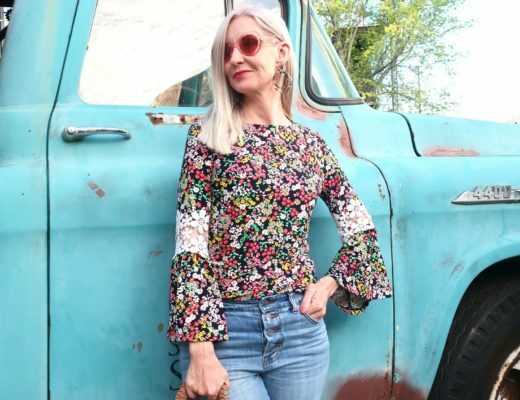 Pam of Over 50 Feeling 40 is boho-rific in this work-of-art tunic. 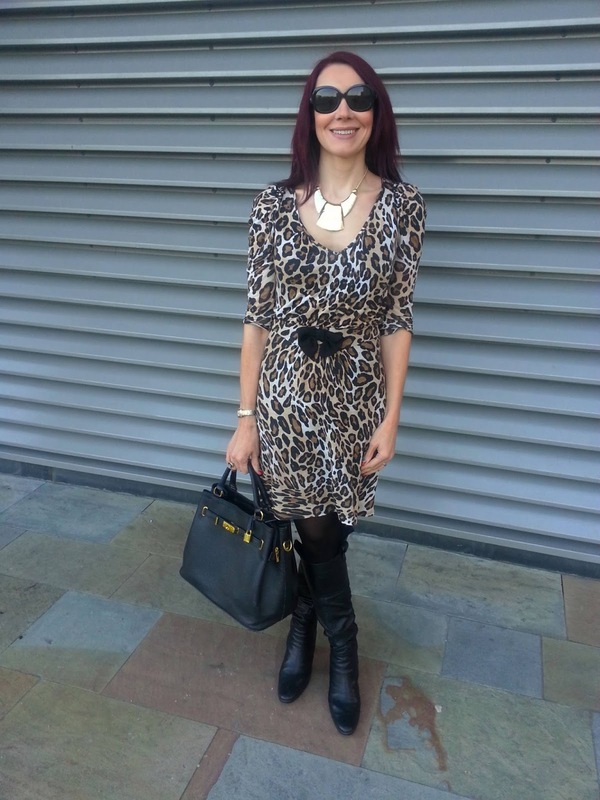 Emma of Style Splash is looking sassy in this pretty leopard dress. Thanks for making picking only three looks so difficult every week! Time for the link up, Dolls! And hey, when you get a chance, be sure to check out Long Hair, Slightly Care, an adorable new blog by my former student, Rae! I LOVE the first outfit! LNBF sounds like a great company! I love all of their clothes!! I am definitely going to check them out! Love your outfit! That black top is amazing. Love all the all black look, so chic! Thank you for hosting and hope you are having a fab week! 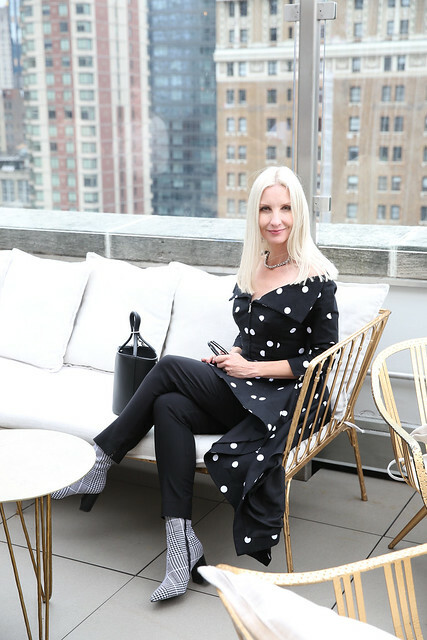 Love you in top to toe black – so chic! Have a great weekend! 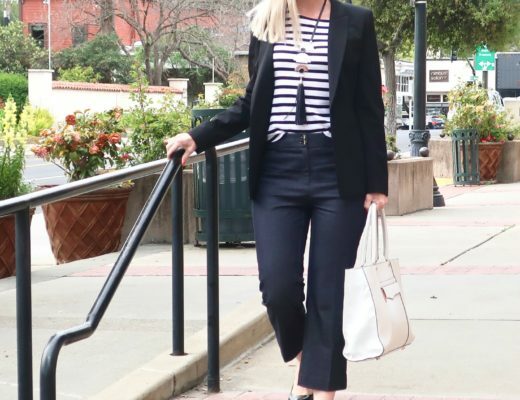 Great fashion for great cause, I love that you have eco in mind for this minimal and chic outfit. 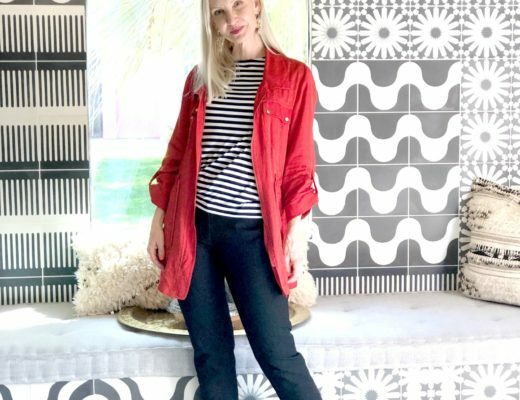 Thanks for featuring the Artful Home tunic, Dawn! I love the LNBF top you are wearing also. And thanks for the link up…have a great weekend! That black tunic is so pretty over leggings! Such a chic look! Wow – this tunic is amazing! Such a fabulous all black look. This company sounds really great, too. Have a wonderful weekend. Ecological fashion, such a wonderful idea for a blog post. Have a great weekend! What a neat brand to discover, and for a good cause! You look amazing Dawn…rock the black! It is not always my first thought either, but like you, I am always glad to find a brand that does both! Cool tunic. I love both looks! Your all black look is so stylish and I love the purple top with the animal print flats. LOVE both looks! 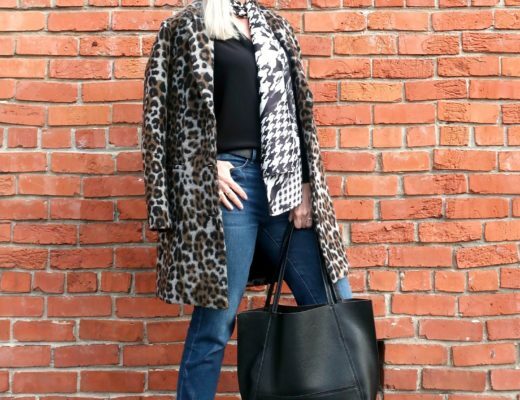 Totally chic all in black, and love your pop of color and leopard slip-ons! It is great that you are showcasing eco-friendly clothing at it's best! I think ECO can conjure up images of sack-like style-free garments, ill fitting and misshapen….worn with ugly shoes. Here you have proved Eco can be super-chic. I am especially impressed that you have taken a potentially boring combination of "leggings and tunic" and made it look sharp and stylish. 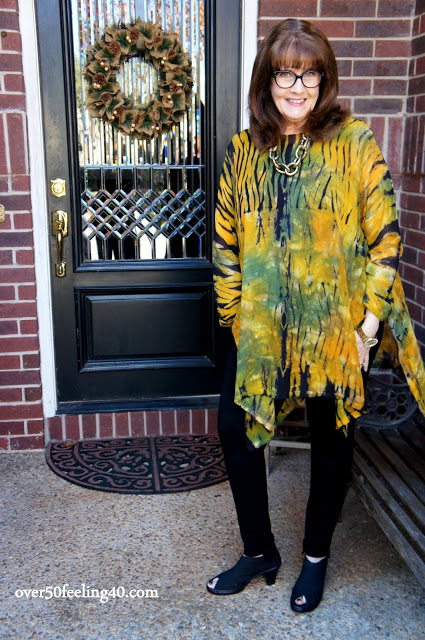 The tunic and leggings looks amazing on you Dawn…I love the layered look of the tunic! It's great when you come across a company that is doing something good for the world isn't it? Have a fabulous weekend my friend! I love that tunic so much and that eggplant top is such a great color! Thanks for the linkup and giveaway! I like that eggplant long-sleeved top. The color is bright and beautiful. The style is neat and simple. I LOVE it! Love your all black outfit! Stunning pieces! I love the purple on you! Such a cool company! Both outfits look great. Both are great looks on you. Simple yet stylish. Eco-friendly clothes have certainly come a long way in recent years. 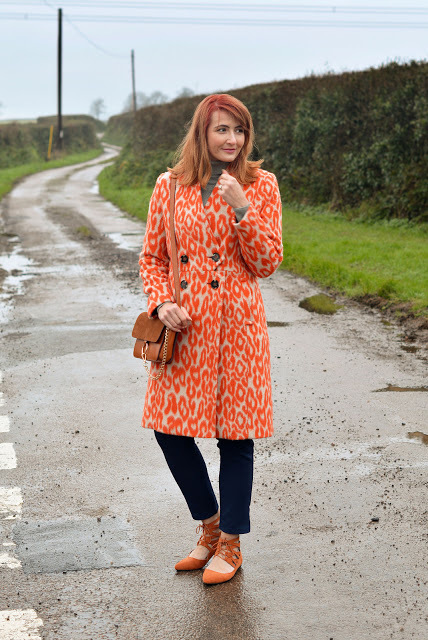 Eeeeee how excited was I that you picked my orange animal print coat as one of your fave picks – thank you Dawn Lucy!!!!! Both outfits of yours are fabulous – especially love the purple colour of the second top. Top marks for eco fashion!! And thank you for hosting, a bit late to the party, had a busy catch-up day as I was away for a couple of days this week…!